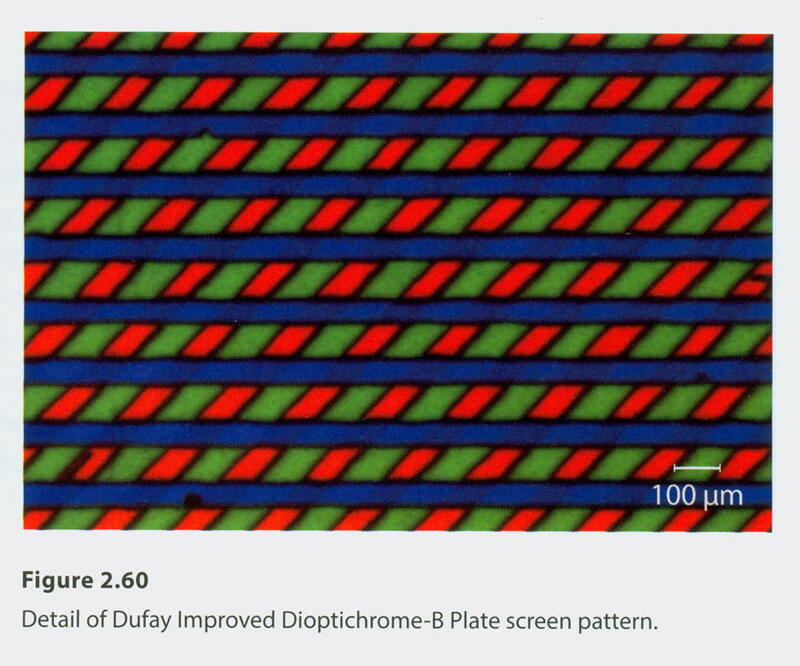 “The screen plate devised by the Frenchman Louis Dufay was made by superimposing a screen of pairs of lines of complementary colours, such as magenta and green, at right angles on a screen of pairs of lines of non-complementary colour, such as cyan and yellow. The combination produced green lines with rows of red and green squares between them. Dufay claimed four colours on his screen, since the combinations of green and cyan and green and yellow produced slightly different hues, but this made no difference in practice. The screen had 150 to 200 elements to the inch (60 to 80 to the cm). The process was first named Diopticolore, when it was announced in the summer of 1908 (at that time the screen was being produced by a greasy ink printing method, like Omnicolore), but the ‘four-colour’ screen process was launched in Spring 1909 under the name Dioptichrome. The screen was mounted in a nickel frame, into which the special ‘Panchro-Inversable’ plate was located with centring springs. 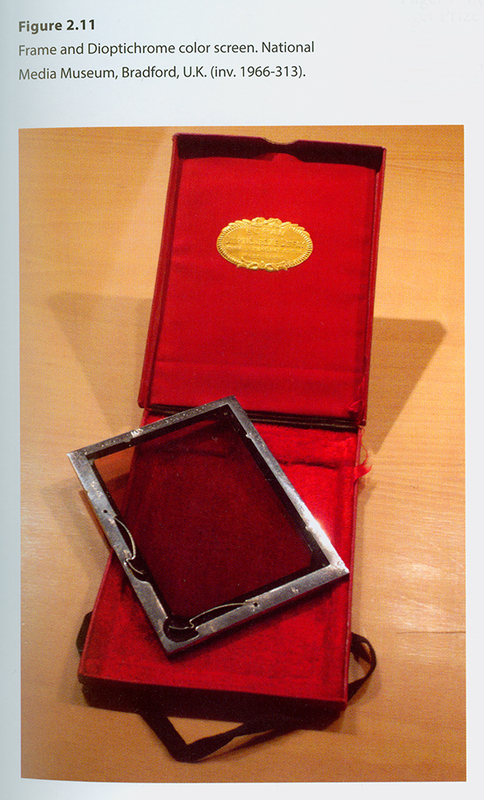 The frame was fitted into the plate-holder, and exposure made in the usual way through the screen. The exposed plate was processed by reversal development, and was returned to the frame for viewing. In the summer of 1910, a new version with an integral screen coated with emulsion was introduced, and around 1912 the method of manufacturing the screen was changed to produce a screen with blue lines alternating with rows of lozenge-shaped red and green elements. “The next Frenchman to enter the field was Louis Dufay, who obtained two patents in 1908. According to the second of these two specifications, a gelatine-coated plate (or film) was sensitized with bichromate and exposed through a line screen before being rolled-up with a layer of opaque greasy ink which adhered only to the hardened areas. The spaces between the ink lines were then dyed red. Next, the whole surface of the plate was coated with a layer of varnish that adhered to and protected the dyed area, but elsewhere could be dissolved and removed together with the underlying greasy ink. Then a new set of greasy ink lines was applied at right-angles to the first set and the unprotected areas between the resist were dyed blue-violet, before the plate was again coated with varnish. By now, one third of the surface of the plate was coloured red and one third blue-violet in the form of alternating rectangles. Finally, the layer of varnish was dissolved together with the greasy ink so that the intervening lines could be dyed green, to complete the mosaic. “The most successful of all the screen processes was the one initiated by Louis Dufay. 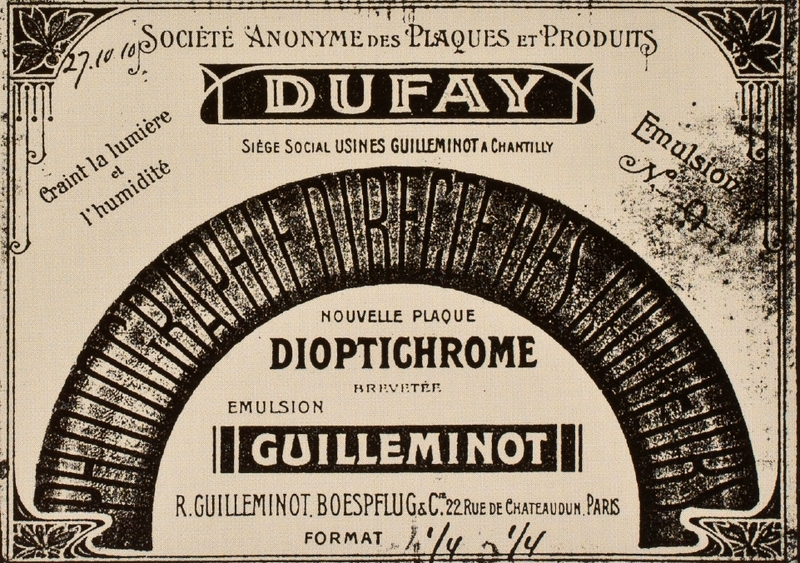 Today the product is known as Dufaycolor, but it was first introduced about 1910 as the Dioptichrome plate. The first Dufay patents were assigned to an organization carrying the quaint name “A Company for the Exploitation of the Process in Color Photography of L. Dufay.” This became the Versicolor organization. Some time later Spicers Limited became interested and such companies as Spicers-Dufay, Ltd., Dufaycolor, Ltd., and Dufay-Chromex, Ltd., were formed to exploit the disclosures. Finally the Ilford company became interested. In the United States there was but one organization, Dufaycolor, which marketed the product. “Although it did not always bear Dufay’s name, the process he invented in 1907 was pursued in modified forms and under various names for over forty years – covering much the same period as the Autochrome process. Louis Dufay, son of the notary in the small town of Baume les Dames near Besançon, was born in 1874. After studying law and working in a practice in Chaumont, he somehow became interested in colour photography and then conceived, and in 1907 patented, a method for producing a geometric filter réseau for a screen-plate. In his patent, Dufay described this procedure at some length. Briefly, a transparent support, having been coated with a thin layer of gelatine, was covered by a pattern of parallel greasy ink lines to serve as a temporary resist. The gelatine between the ink lines was then dyed red. The surface of the plate was then coated with a varnish that adhered to and protected the dyed areas but elsewhere could be dissolved and removed together with the underlying greasy ink. Next, a new set of greasy ink lines were printed at right-angles to the first and the unprotected areas between the resist dyed blue-violet. The whole surface was again varnished and the resist removed. By now one third of the surface was coloured red and one third blue-violet in the form of alternating rectangles, while the remaining third of the area, represented by parallel lines, was dyed green to complete the mosaic. 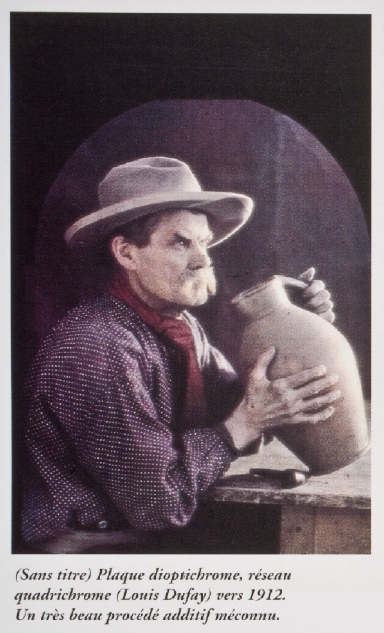 This may seem to be a very complicated way of forming a mosaic of red, green and blue filters, and in fact the method was simplified later, when Dufaycolor was produced on film-base. 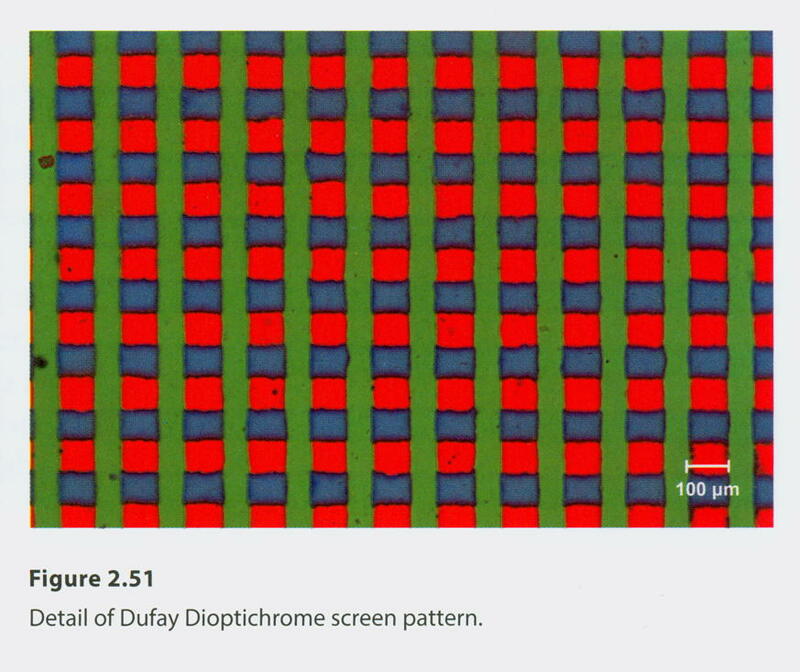 There is evidence that in 1908 Dufay tried to interest Lumière in his patent, but by then that company was probably quite happy with their method of producing a random screen pattern. He had more luck with Guilleminot, a plate and paper manufacturer with a factory at Chantilly, where Dufay and his family went to live in 1909. A company name la Société des Plaques et Produits Dufay was formed with a capital of 420,000 Frs. and the plates were called Dioptichrome. They were on sale for only a few years, the most successful of which was 1911, when 40,000 plates were sold. 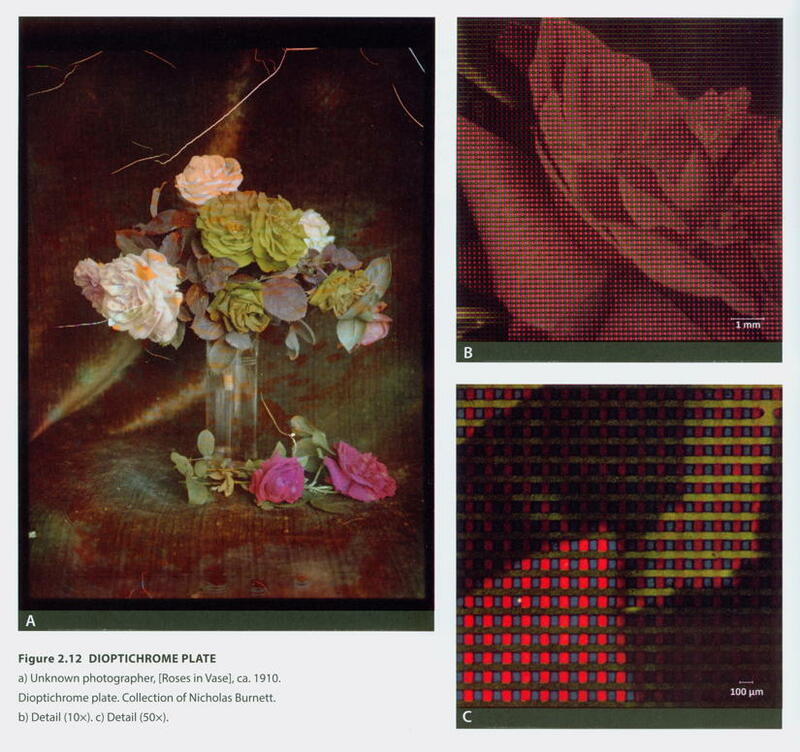 Because there were no gaps to fill between the filter elements as there were with the dyed starch grains of an Autochrome, Dufay Dioptichrome plates were faster and the results more transparent than the Lumière product. But the resolution of an Autochrome was far superior to a Dioptichrome transparency because the filter réseau of the latter only contained about 40,000 elements to the square inch compared with the millions of starch grains covering each square inch of an Autochrome. 16 English Patents 11,698 and 18,744 (1908). 17 It was also referred to as Dufay screen plate in the press. British Journal of Photography (BJP). 1918. 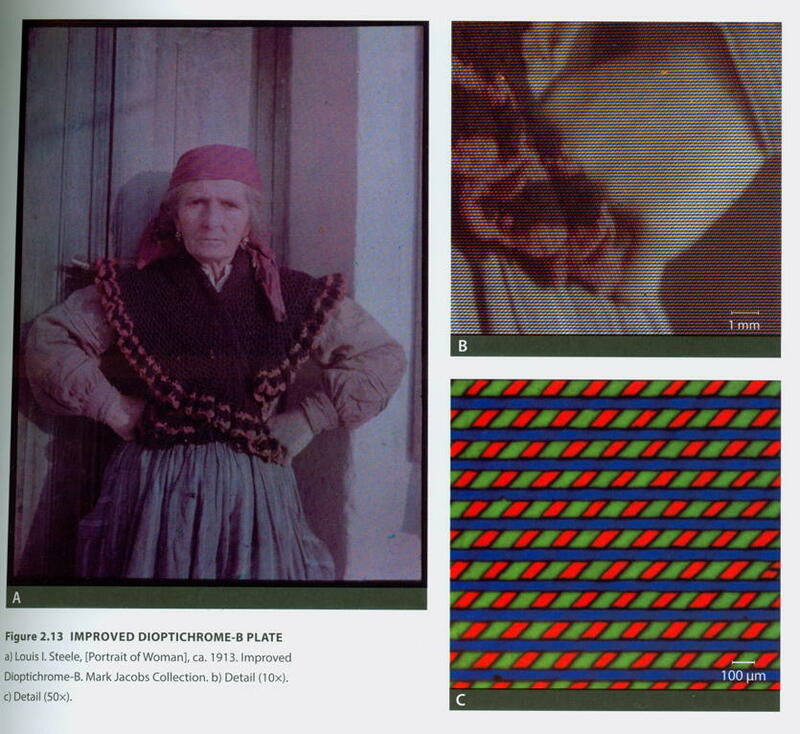 “Processes of Making Colour Screen-Plates.” British Journal of Photography Monthly Supplement on Colour Photography (May 3): 18–20. Coote, Jack H. 1993. 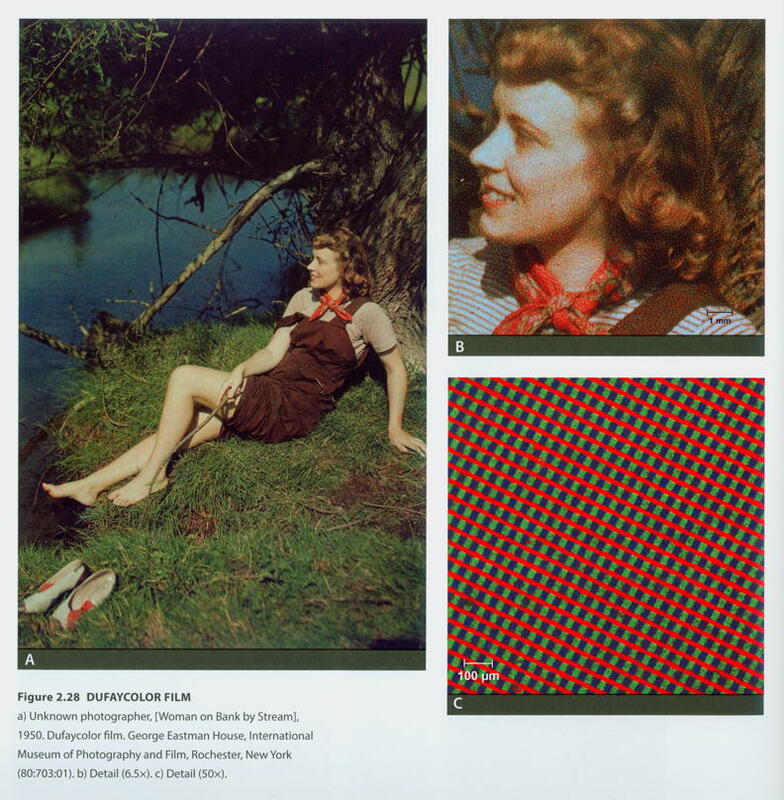 The Illustrated History of Colour Photography. Surrey, U.K.: Fountain Press. 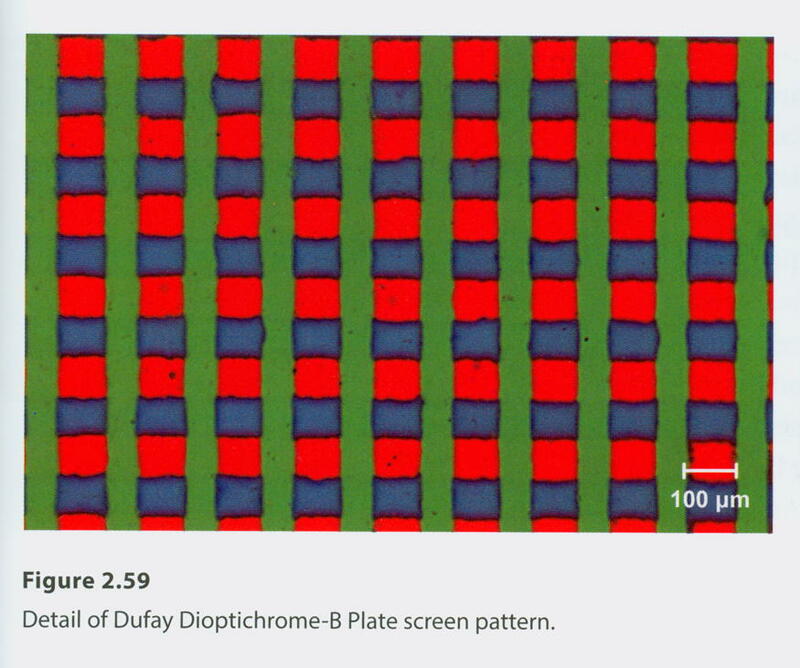 “Dufay Dioptichrome-B Plate (1910-1912): screen pattern identical to that of the viewing screen from the Dioptichrome separate system (Fig. 2.59). There are continuous lines of green color (approximate width 0.06 mm) in between which are squares of alternating red (0.07 x 0.1 mm) and blue (0.065 x 0.9 mm) color. Lines are perpendicular to the edges of the plate. The blue rectangles have a black outline and are slightly smaller than the red ones. Fading of the dyes is common and existing plates are dominantly purple. Channeling of the screen and cracks in the gelatin emulsion are common.